As times have changed so has the option of having an online presence for yourself or your business. Today its more important than ever to have a well crafted, unique, web site. I am a firm beliver of creating a site that is unique to each person or business, so no 'cookie cutter' designs are ever used! I work hard to try to create a website that is clean, easy to navigate that helps to promote you in the best way possible. 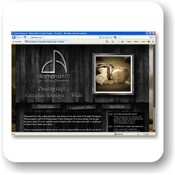 I create each website using HTML, CSS as well as I am able to offer ColdFusion and SQL coding to help you create a unique, dynamic website. I hand code all of my sites in order to ensure that they work well with many different broswers: IE, Firefox, Opera, Chrome. Each site is tested constantly during production on several computer running different operating system versions and browser versions. Also each site is tested to make sure that they fit correctly on different sized monitors. This is a collection of some of the many projects that I have created for either clients or for personal projects. You can click on each of the screenshots below for additional project information. 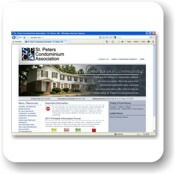 CondoWare was a project developed while I was working for the St. Peters Condominium Association. The site was created as strictly a 'back end' website for the assocition to manage and maintain almost all aspects of the community. The site helped the association office to manage the unit owners, residents, vehicles, pets as well as specific information about each unit. As this was not a 'rental' community most off of the shelf software would not work as they did not lease any of the units directly. CondoWare was strictly 'cloud based' as all information was accessable by office staff from any internet connection, even using mobile devices while on the grounds. The website for the St. Peters Condominium Association was created as a way for the office staff to provide information to owners/residents and other investors of units in the association to help reduce phone calls and letters to the office. 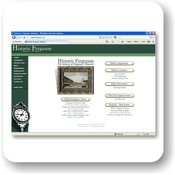 The website was organized to be as simple as possible for the visitors as many of the residents of the community were seniors. 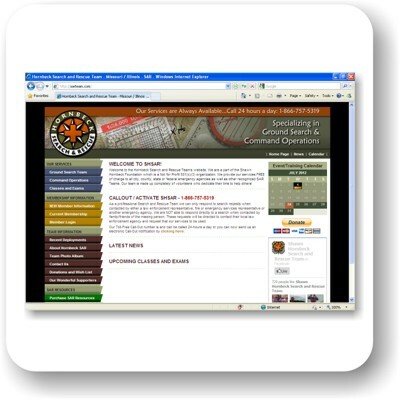 Unlike many other sites the SPC website allowed for visitors to view all of the newsletters and board meeting minutes dating back to 2004 so they had plenty of reference at their fingertips. The SPC site allowed for quick information retrieval by the visitors when important news happened with the board. When Shawn Hornbeck ( an 11 year old from Richwoods, MO ) was abducted, family and friends came together to help search for Shawn. I knew Shawn and his family and came down to help the day after he vanished and helped the family form the Shawn Hornbeck Foundation to not only help look for Shawn but other missing children as well. 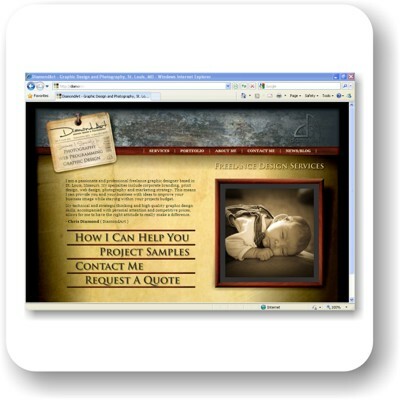 The site gives information to visitors about how to help protect children from being abducted as well as it offeres information about current children who are missing. 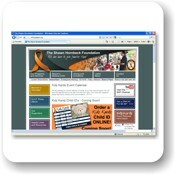 The foundation offers Kidz Kardz, Child ID cards for parents to carry with them in the event that they are separated. 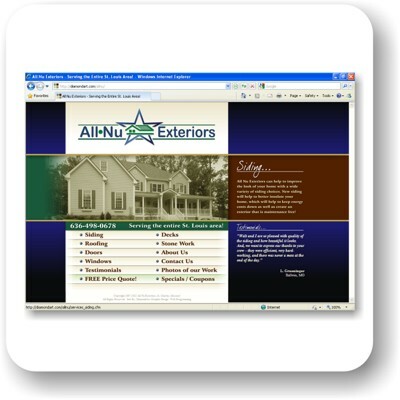 I was asked to create a website for All*Nu Exteriors who provides exterior home renovation services in the St. Louis, MO area. As they did not have an 'electronic' copy of their logo I had to recreate it from a business card. After moving to a 100+ year old home located in Ferguson, MO in 1999 I began doing research on the home and the original builder. As not much information was available online at the time I decided to start a project for the City and the Ferguson Landmarks Commission ( which I was a member of for 6+ years ) that would have the information about each century home and historic landmark in the city. 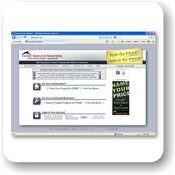 The site is backed up with a SQL database to house all of the data about each of the homes and landmarks. The site also has a 'ditial walking tour' of the homes similiar to what can be done using one of the actual walking tour brochures available at city hall. I am in the early phases of looking at a site overhaul and re-design as the Landmarks Commission is wanting to do some updates to it. 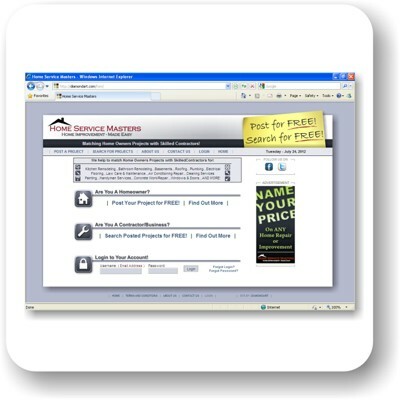 I was hired to create a website to help rival the larger ServiceMaster website that the customer currently used for job leads in the construction industry. The customer wanted to create the site where customers could come post jobs for free and then allow for 3-4 contractors, for a low fee, to bid on each project. The contractor could see each postings information, except for the contact information, and if they wanted to bid on the job they could then pay for the contact info. The site used a SQL database to now only house all of the data but it used a radius search program to allow for contractors to see all jobs within a radius around them. I also had to create the code to allow for seamless credit card processing with the site owners credit card company. Prior to this site being developed I was the artist working with another individual who was the sales person for an advertisement program called 'Big Value Brochure' who sold advertising to local businesses and then had them distributed by McDonald's locations ( with coupons for McDonald's included ). After several editions printed the lead sales person just 'vanished' so I worked with the local McDonald's locations in order to contiune the project under the Community Coupon Circular name. The site was built to help advertisers find information about the brochures, ad info and sizing as well as pricing. The site gives a few samples of the brocures that were created for McDonald's before I ended it a few years ago. A former employeer has 2 condominium rental units in Florida that he rents out to anyone wishing to pay a rental fee for their time in the unit. I created the original unit's website back in 2002 and was asked to create a new one for their newest property. The new site has more of a resort feel than the other one did. The photo album was updated to not have to open each photo in a new window ( best that could be done at the time of the original ). 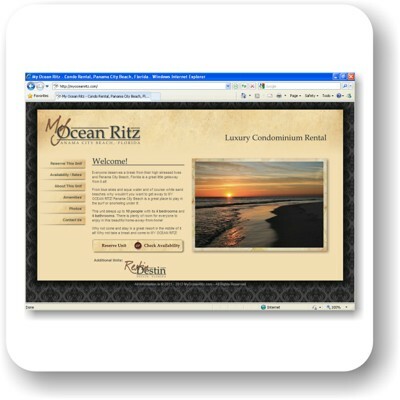 The sites owner can use an administration page to change the availablity calendar and unit rates. The site also keeps track of all customers for the owner. While creating this site I updated the other units site to look and function in a similar way. The Hornbeck Search and Rescue Team is a division of the Shawn Hornbeck Foundation. As a co-founder of the team I wanted to create a website that would allow visitiors to view our services as well as contact each of the members directly. All of the artwork was created by me, including the grid reader and the compass on the top of the page! I have partenered up with a friend to help him launch a new product for the wine industry, pre-packaged Wine in a Glass! The glasses are recyclable plastic wine shaped glasses that will be sold to stadiums and large venues starting next spring. The site seen here is 'almost' final as we are waiting on the new glass prototypes to come in with the correct lids. Until then he is working on a pre-packaged coctail line that should be in stores in a few months! 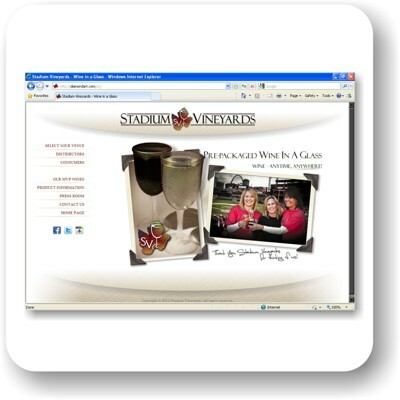 I took all of the wine glass photos on the site as well as created the Stadium Vineyards logo for the company. Members of a local dirt track auto racing team partenered up with the Shawn Hornbeck Foundation to not only sponsor the foundation but to help raise awareness of missing children by placing photos on the vehicles. Craig Akers, one of the co-founders of the foundation, was one of the racers of the team. 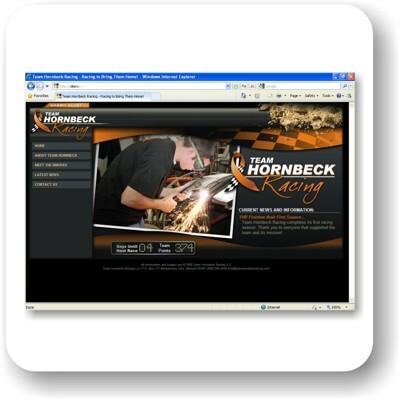 The site was used to help promote the team as well as keep track of the racers information and team standings. The team no longer races so the site has been removed. 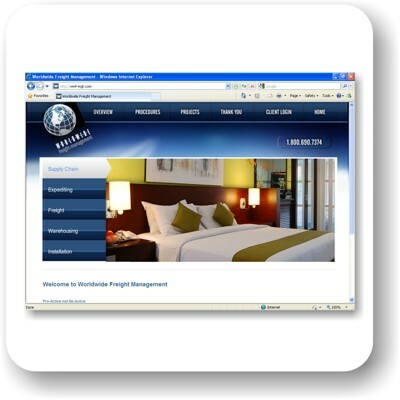 Worldwide Freight Management is a company that helps hotels and the hospitality industry with their re-design and remodel logistics. The company coordinates shipments of all goods required for the jobsite when they do a remodel of their facilities. The site was to be an informational brochure for the company and is one of the very few sites of mine that actually uses any Flash. I have already been in contact to do a complete redesign of the site, including logo design, as company is changing hands to one of the companies original founders. This section is for projects that were used for a website mockup that were never used for the customer or for sites that are in current production and will be launched soon. I am currently developing this website for a Personal Training Gym in the Downtown St. Louis, MO area. The site will include all features of the gym as well as other classes/courses that are offered at their facility.. This was a mockup of what the diamondART website was going to look like. This was the version just prior to the current one you are seeing now. The wood was actually a photo of a wood floor. I took that and weathered it and created the bowing and warping in CorelDRAW. I then created the hanging signs using cutouts of the wood photo and made small chains to hold the signs up. Weathering was done on the text below the logo to make it look like it was faded and well worn. 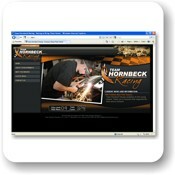 Visit the Site - NOTE: Links and content are not complete and the site may not function properly on all pages. This was another variation that I was trying for my website that was started prior to the wood one to the left. The tag with the logo was all created using CorelDRAW including all of the weathering and 'dirt' that is seen. The site used much darker, richer colors which I like but it started to cause issues when I was working on the portfolio section so I just created the main page. Pricing for my web design services will vary depending on the project and its complexity and additional resources required to construct and test each site. Payments for my web services are divided into installments divided over the length of the project using PayPal or via Credit Card in person. © 2019 Chris Diamond - All Right Reserved. 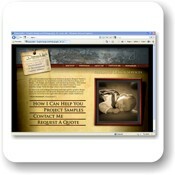 Material on this site may not be reproduced without the expressed permission of Chris Diamond.